Francis Smith of Warwick (1672-1738), together with his brothers William and Robert, worked hard on the rebuilding of the town of Warwick after the disastrous fire of September 1694. The brothers became the most famous architects and building craftsmen of the early seventeenth century in Warwickshire, responsible for numerous country houses in the region. When the last Smith died in 1747, the business was continued by the mason/architect brothers William and David Hiorn. The Hiorns worked on several country houses - Packington Hall, Compton Verney, Charlecote among others, but in a subordinate role. The Warden and Society of Sutton decided to undertake extensive repairs and alterations to Sutton’s Parish Church of Holy Trinity in 1758. They called on the best local architect to draw up a plan - William Hiorn. On November 2nd 1758 the Warden and Society resolved that trees to the value of £657 be felled in the Sutton Park. The money raised would pay for the new seating and other improvements to the inside of the church according to a plan by “Mr. William Hyrons”. In May the following year part of the church collapsed, and a special meeting of the Warden and Society was called on the 14th “to consider how the breach of the Parish Church must be made up again - it being supposed to be done by the carelessness of the men employed by Mr. Hiorns in making preparation for the new pewing”. The Chancel was to be adapted as a temporary church. At the June meeting it was conceded that they had been too hasty in blaming the workers, and that the collapse was due to poor foundations. More trees were felled, and Mr. Hiorns’ accounts were finally settled in September 1761. The repairs entailed the rebuilding of all the arches and pillars, using sandstone from a local quarry. The arches were modelled on the ones put up by Bishop Vesey, but with much larger pillars. New pews replaced the worn out old ones, and a new south gallery complete with eleven box pews was built of oak from Sutton Park with money raised from the sale of yet more park trees. 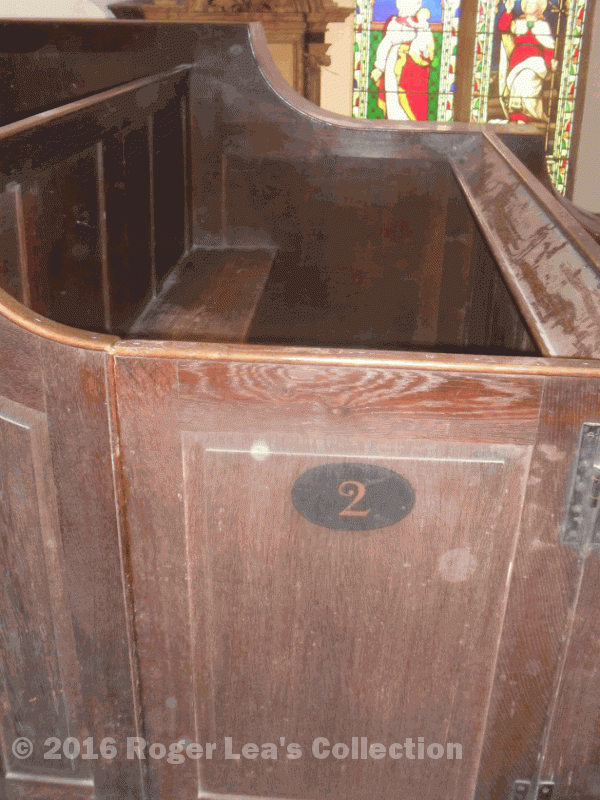 Box pews were regarded as belonging to specific Sutton properties, and there were angry scenes when some householders found that their new pews were less favourably placed than their previous ones. 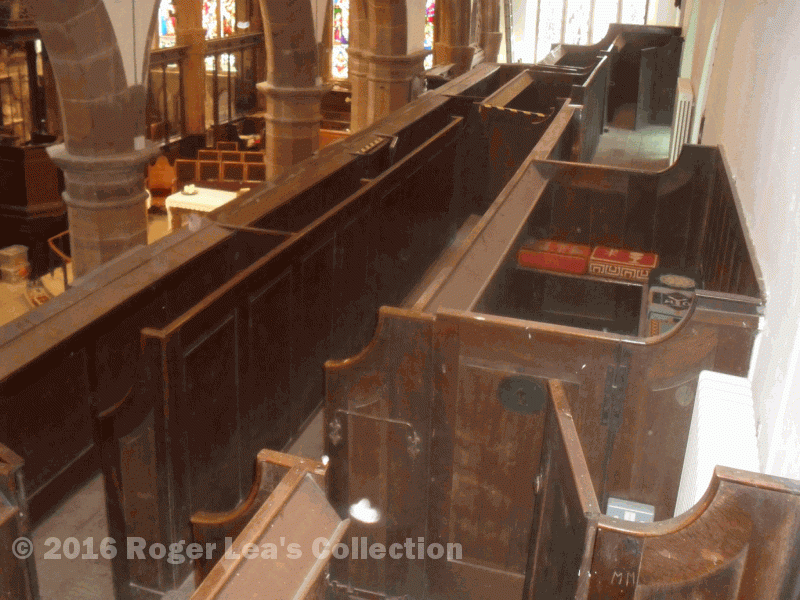 The eleven box pews in the new gallery seem to have been highly rated, box pew no. 7 belonged to Joseph Duncumb of Moat House, William Jesson had no. 6, and 9 went to Mrs. Mary Riland, the Rector’s widowed mother. Public open days at the church, when you can see Hiorn’s pillars and gallery at leisure, as well as all the other historic features, have been arranged for Saturday June 17th, 2-4 pm and Saturday July 22nd, 11 am to 3 pm. The South Gallery in Holy Trinity Church, showing the box pews and the pillars constructed by William Hiorn in 1760. Box pew no. 2 in the South Gallery belonged jointly to Hannah Whywall of the house in High Street now NLegal offices, and Mr. Nicholas Dolphin of Doe Bank, according to a plan of 1762.